What to Make of the Droning on Drones From the Right? 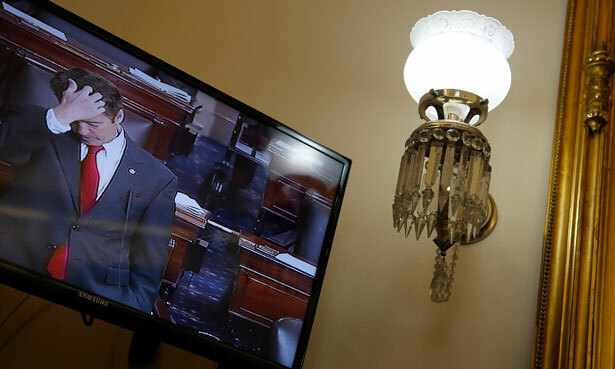 A surprising number of conservatives backed Rand Paul's filibuster. How much of that was sincere? For clues, I cranked up the Patented Perlstein Wayback Machine that lives on my hard drive and discovered the following interesting parallel from 1945, when what would become the Central Intelligence Agency began as a gleam in the American security establishment’s eye. William “Wild Bill” Donovan, head of the wartime spy agency the Office of Strategic Services, proposed to the president that his outfit be made permanent. The news was leaked to one of the most reactionary reporters, Walter Trohan, of one of the nation’s most reactionary major newspapers, the Chicago Tribune (Trohan was one of the infamously bureaucratically jealous J. Edgar Hoover’s favorite reporters, and the leak almost certainly came from Hoover). These were the sort of (“isolationist”) Republicans who had been skeptical of going to war with the Nazis in the first place—so of course it’s fascinating to see them deploy the argument ad Hitlerium to leverage their hatred of FDR. There are historical complications, to be sure: the permanent spy agency that did end up being invented out of Donovan’s efforts—we call it the CIA—did indeed dangerously centralize power, abusing it badly, so there is a prophetic cast to these utterances. At the same time, the OSS and its CIA successor were notorious redoubts of just the sort of Eastern establishment nabobs long despised by conservative Republicans (you can see a fine depiction of that history in the 2006 Matt Damon film The Good Shepherd), lending an unmistakable air of political turf-maintenance to their complaints. The clincher? People like this were utterly silent about the actual American Gestapo in their midst, except when they were praising it to the skies: the one run by J. Edgar Hoover, whom conservatives universally and consistently adored. Now we have another CIA program dangerously abusing public trust. And suddenly conservatives are up in arms. There’s plenty more to say, true, about what Rand Paul might mean for the dormant conservative tradition of distrust for the security establishment; about the Obama administration’s own awful implication in institutionalizing that establishment’s mushrooming abuses; and, too, concerning the unfortunate indifference of too many Democrats and liberals to those abuses when the guy running show is one of “ours.” But in the meantime, while we think about that stuff, let’s not neglect the obvious: conservatives have always been at war with Eurasia’s spy apparatus. Or Eastasia’s. Or Oceania’s. When it happens to be run by Democrats, I mean. Rick Perlstein last weighed in on the Bob Woodward debacle, noting that the journalist's series of books about the Iraq War went from approving to critical in tone—perfectly in line with the changing tastes of the majority of book-buyers.